Once again CLIG excelled itself by providing very prompt income, balance sheet and cash flow summaries after the group’s year end. This time it took just 11 working days to supply the figures to shareholders — other quoted companies please take note! * Lower fees from clients? Mind you, this trend may be distorted by CLIG’s rounded FUM figures. 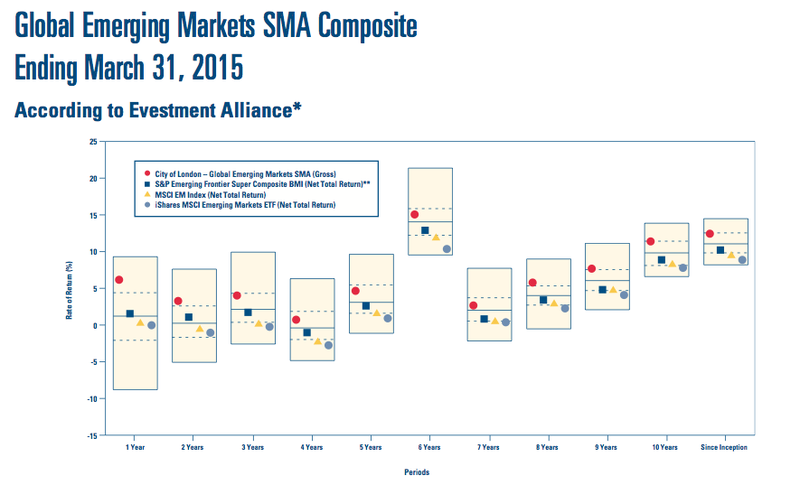 Today’s update claimed “investment performance in the emerging-markets closed-end funds strategy remains strong, with first- or second-quartile results versus manager peers year-to-date in 2015”. 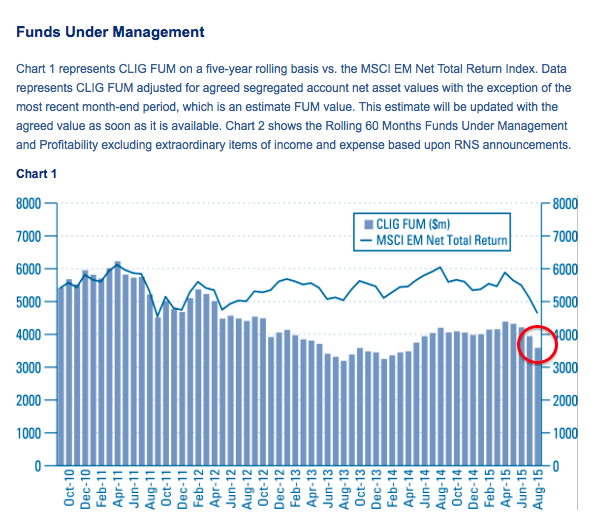 I’m hopeful this level of outperformance can help attract new client FUM. I was pleased to see margins for 2015 come in at a super 34% — the highest since 2011. 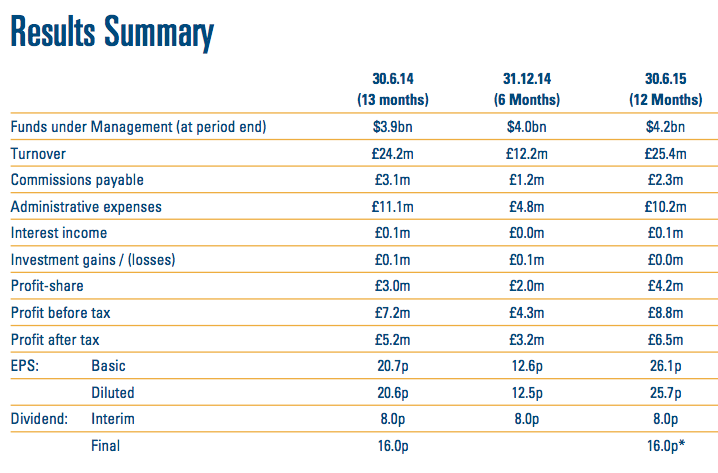 Turning to the balance sheet, today’s summary figures showed net cash and investments at a healthy £11.7m. (My reading of CLIG’s capital requirements suggests £1.6m is required for regulatory reasons and should not be deemed as being ‘surplus cash’). …ensured today’s 26p EPS figure was no surprise. Nonetheless, I will happily take the 24p per share dividend and I note CLIG’s target dividend cover remains at 1.2x over a rolling five-year period. Just so you know, I calculate average dividend cover for the last five years to be 1.17x — and that earnings would have to rally to 38p per share during 2016 for dividend cover to average 1.2x for 2012-2016. For now at least, I think it is best to expect yet another 24p per share dividend for 2016. CLIG had previously assumed it would add “£2.9m to reserves” during 2016, which suggested next year’s earnings could have been £8.8m (£5.9m dividend plus £2.9m surplus) or about 33p per share on the total share count. However, CLIG is now looking at retaining £1.4m during 2016, which indicates earnings may be £7.3m (£5.9m dividend plus £1.4m surplus) or about 27p per share. The ‘downgrade’ is due to CLIG now expecting $500m of new client money (previously $1bn! ), market growth of 0% (previously 5%) and overheads growing at 8% (previously 5%) during 2016. My estimate of surplus net cash and investments less regulatory capital requirements is £10.1m or 38p per share. 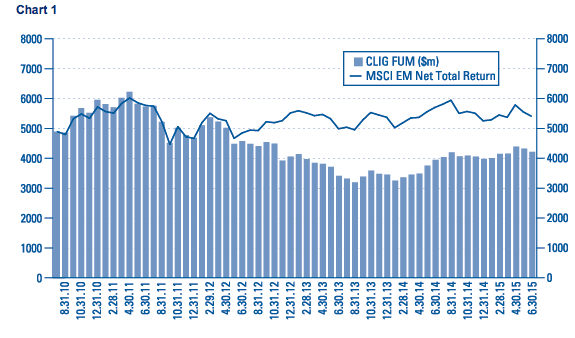 CLIG’s enterprise value (EV) is thus £81m or 302p with the shares at 340p. 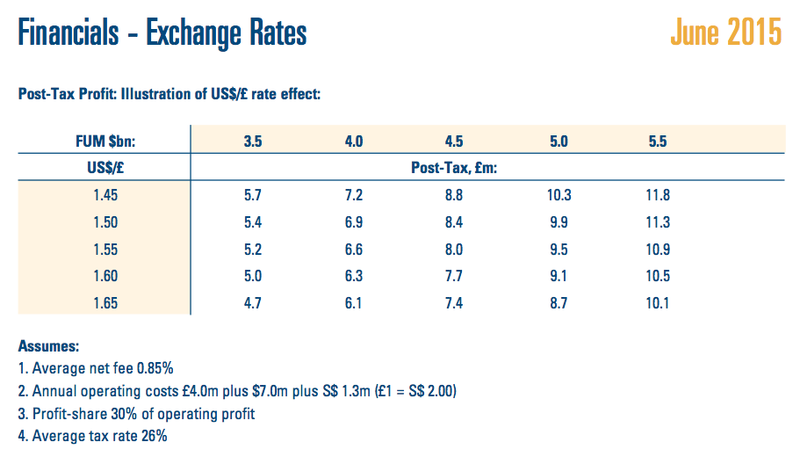 Using the above post-tax profit/FUM model, I reckon FUM of $4.2bn and a £1:$1.57 exchange rate could equate to earnings of £7.1m or 26.3p per share. The underlying P/E on my EV and EPS estimates is therefore 11.5, which does not look extravagant to me for such an owner-friendly operation. The 24p per share dividend continues to supply a 7.1% yield. * Next updates — full annual results 14th September, AGM 19th October. This update shows positive progress when looking at the Results Summary i.e. the 13 June 2014 (13 months) performance. However part of the rationale for me buying into CLIG was their anticipated growth assumptions which, in less than a year, have now been severely curtailed without any real explanation. Now this could be prudent planning or it can be viewed as something more serious; or being the optimist there could be a very healthy surprise in next years results. I would have liked additional commentary on why their expectations have changed. Am looking forward to the Final results on 14 September 2015 for additional clarifications. Yes, we were only told of ‘increased volatility’ had curtailed the expectations. Should be some additional clarification in the full results as you say. I had thought projections of 10% market growth were ambitious for the forward guidance and, for my valuation sums, I’ve used current FUM and that helpful earnings/FUM model table rather than the template projections. 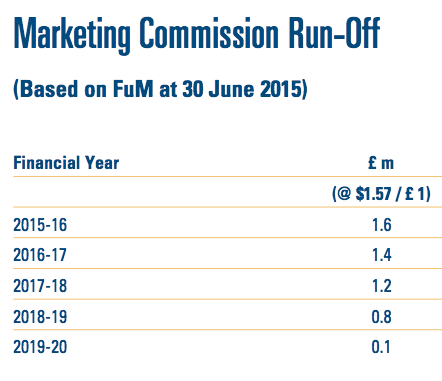 FWIW this time last year, CLIG’s forward guidance template predicted earnings of £6,835k for 2015. The actual figure was £6,490k. Feed that $4bn into my valuation sums within the Blog post above and potential earnings reduce from £7.1m to £6.5m, or 24.2p per share — and just enough to cover the 24p per share dividend. With the shares at 365p, my EV calculation comes to £88m or 327p per share. My EV/EPS ratio is now 13.5. Feed $3.55bn into my valuation sums within the Blog post above and potential earnings reduce from £7.1m to £5.5m, or 20.4p per share — and not enough to cover the 24p per share dividend. With the shares at 335p, my EV calculation comes to £80m or 297p per share. My EV/EPS ratio is now 14.6. I’ve decided to sell 42% of my CLIG holding this morning at 335p, because were FUM to continue at current levels for some time, the present P/E rating would be towards the top end of CLIG’s historical range. I recall when FUM hit $3.5bn during 2013, the share price dipped as low as 220p. 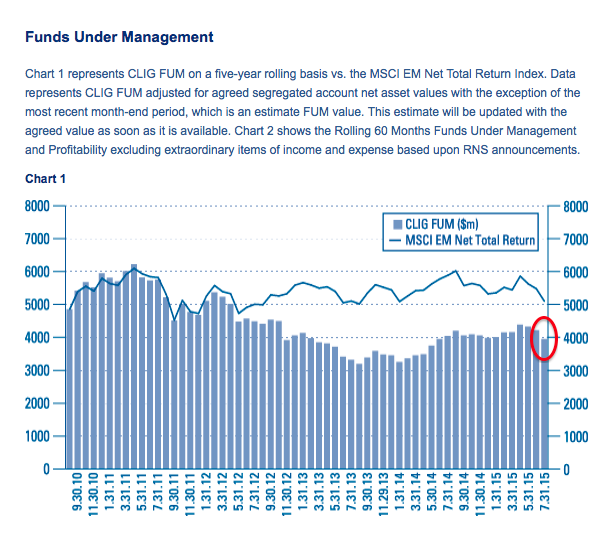 Also, were FUM not to recover, the 24p dividend must surely come under pressure during 2016, while CLIG’s forward guidance projection will also need to be revised downwards. Full-year results will be issued later this month and I will be interested to hear what the firm says about current market conditions. Why ‘42%’ that seems a very precise number? Anyways, during the volatile trading on Aug 28th I managed to sell my entire holding at 343p/share crystallising a reasonable profit. Reason for selling is the same as yours although at the time I was unaware of the precise fall of FUM; although a fall was inevitable and I would not be surprised to see a further fall come next month’s report. Nevertheless the clarity of CLIG’s reporting means I shall keep this on my watchlist for the medium term. The 42% was what I had in a certain account — I just cleared that out. It was about the right number for me.